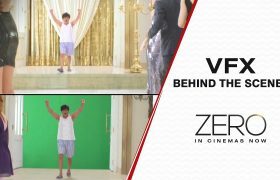 Zero The Making of Husn Parcham Presenting herewith the making video of Husn Parcham song taken from the film Zero. The film features Anushka Sharma, Katrina Kaif, Shah Rukh Khan in the lead roles. Aanand L Rai has directed the film and it is produced by Gauri Khan. Watch the making of ‘Aao Kabhi Haveli Pe’ song taken from the film STREE. It is a horror comedy movie in which Kriti Sanon is the main female lead. The film will release in cinemas on 31st August 2018. Tum Bin 2″ is an upcoming Indian romantic drama film, written and directed by Anubhav Sinha and produced by Bhushan Kumar, under the T-Series banner. The film is the sequel to the 2001 romantic drama film Tum Bin. Neha Sharma, Aditya Seal and Aashim Gulati are in lead roles. Befikre is an Hindi romantic drama film, the script is written, directed and produced by Aditya Chopra under his Yash Raj Films banner. The film features Ranveer Singh and Vaani Kapoor in the lead roles. Watch making of the song “BOLO HAR HAR HAR” taken from the Upcoming Bollywood Movie “Shivaay”.Ajay Devgn, Sayyeshaa, Erika Kaar, Abigail Eames, Vir Das, Girish Karnad, Saurabh Shukla are the casts of the movie ,produced by Ajay Devgn, Dhaval Jayantilal Gada, Shreyans Hirawat and directed by Ajay Devgn. ‘Baar Baar Dekho’ is an upcoming Hindi film of 2016. The movie casts are Sidharth Malhotra and Katrina Kaif. The movie is releasing on 9th September, 2016. Watch behind the scenes ,making visuals of power-packed entertainer movie ‘Sultan’. ‘A Flying Jatt’ is a latest Hindi film directed by Remo D’Souza featuring Tiger Shroff, Jacqueline Fernandez and professional wrestler Nathan Jones in lead roles.Actor Shroff is playing the role of a superhero and Fernandez has been playing the female lead. Akira is an upcoming Hindi action drama film , which is directed and produced by AR Murugadoss. It is the remake of Tamil film Mouna Guru, released in 2011 .The film features Sonakshi Sinha in lead role. Konkona Sen Sharma is another character of the movie. Music of the movie is composed by Vishal-Shekhar. Watch the behind the scene videos of Akira movie. The movie features Sonakshi Sinha, Konkana Sen Sharma and Anurag Kashyap, directed by A.R. Murugadoss and produced by Fox Star Studios & A. R. Murugadoss. The Big Friendly Giant film story tells the imaginative story of a young girl and the giant who introduces her to the wonders and perils of the Giant country. It is American Oscar-winning director Steven Spielberg’s latest film that was premiered at the 69th Cannes Film Festival. A Flying Jatt’ is an Hindi film directed by Remo D’Souza featuring Tiger Shroff, Jacqueline Fernandez and professional wrestler Nathan Jones in lead roles.Actor Shroff is playing the role of a superhero and Fernandez will be playing the female lead and his love interest in the film. Dishoom movie features Varun Dhawan, Parineeti Chopra, Jacqueline Fernandez, Akshay Khanna in leading roles, the film is produced by Sajid Nadiadwala & Sunil A Lulla.Parineeti Chopra has done a dance number along with Varun Dhawan.